This 20 ” diameter contemporary design combines bevels, textured clears, cinnamon and clear streaky baroque glass and light and dark greys. These beautiful windows sparkle in the sunlight!. 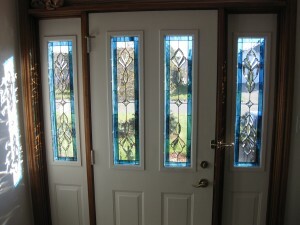 These custom sidelights and door panels were designed and made at Breslau Art Glass. This is a beautiful way to brighten up your entryway, and add interest and colour to an area that is viewed from inside and outside. 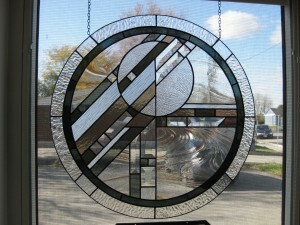 The bevel clusters are surrounded with textured clear glass and bordered with turquoise and blue streaky stained glass. Notice how the sunshine sparkles on the wall to the left.